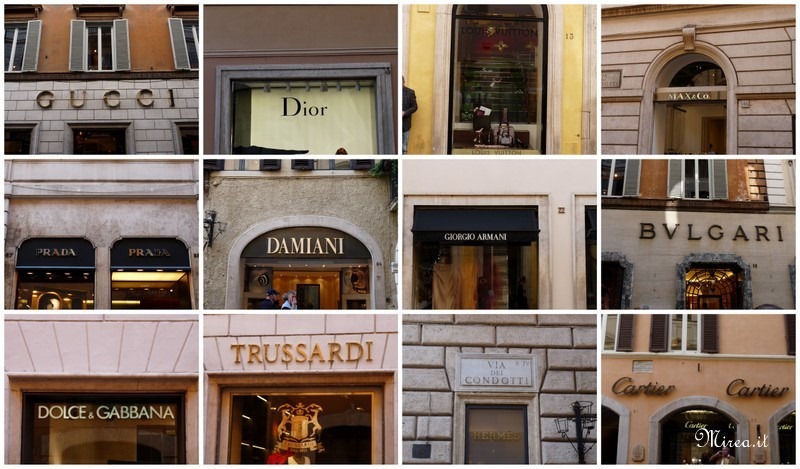 Considered the Rodeo Drive of Roma, Via Condotti is without a doubt the place to find shops where one can find authentic 'Made in Italy' designer clothing such as Gucci, Ferragamo, Versace, Trussardi, Prada, Valentino, Armani, Dolce and Gabbana. Fine leather goods and accessories by famous names such as Louis Vuitton and Bally, to name a few, are also found here. World famous jewelers including Bulgari and Cartier among others have also taken their place on Via Condotti. This shopping street also leads you to Via Veneto, the Spanish Steps, and many other nearby shops where one can contiune their shopping day of buying or just window browsing.